IHG Business Rewards has new offer for meetings and events organized at participating Kimpton hotels by December 30, 2018. Members can earn one time bonus of 50,000 points at each participating hotel for a contracts signed up by August 30th. The minimum value to earn the bonus points are hotel dependent. 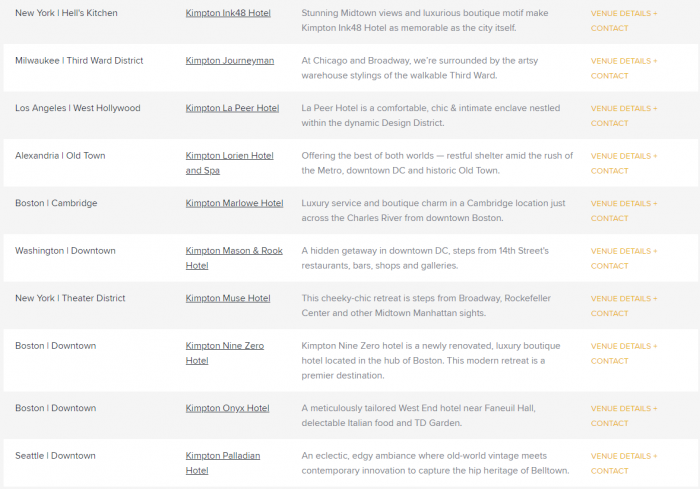 Kimpton seems to be on overdrive to get all the hotels participate to these IHG wide programs including Business Rewards that tries to incentivize meetings organizers to drive more business to these hotels by offering bonus points. Must be a registered IHG® Business Rewards Member, for further information visit ihg.com/businessrewards. Members will receive a one-time bonus of 50,000 IHG® Reward Club Points at each participating Kimpton hotel, after a group contract is actualized, plus 3 (three) IHG® Rewards Club points for every $1 USD of the qualifying spend for room nights and events booked between May 22, 2018 and August 30, 2018. All qualified spend booked with this limited time offer must be consumed by December 30, 2018 at participating Kimpton hotels. Eligibility is based on a minimum required spend, which varies by participating Kimpton Hotel. Promotion is based upon availability and does not apply to groups already contracted at a Kimpton Hotel prior to May 22, 2018 and/or in conjunction with another promotional offer. Offer not applicable on Base points (3 points/$1USD) previously paid by participating Kimpton Hotels prior to May 22, 2018. All bonus points and base points for this offer are paid to members directly by the participating Kimpton hotel. Additional local concessions paid by participating Kimpton Hotels. Additional terms and exclusions apply. Hotels not participating in this promotion are: Kimpton Saint George Hotel, Kimpton Canary Hotel, Kimpton Hotel Eventi, Kimpton Seafire Resort + Spa. View IHG Business Rewards full terms & conditions.